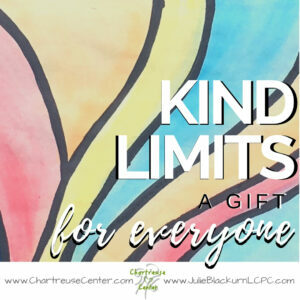 I actually started using the tenants of Kind Limits when I was working in the corporate world. Over the years, I heard time and time again from clients they struggled with the idea of “boundaries” or the people in their lives not responding to them or even begin down-right disrespectful. There were a number of underlying internal conflicts or incongruencies that include issues of being viewed as mean or too firm, maybe disappointing someone, potentially excluding, general fear or worry and no longer being included or liked because they spoke up. I continued to use these tenants when faced with similar conflicts or incongruencies within my own life in all sorts of situations. I’m sharing this with you because I have found that incorporating kindness, thought of my own needs, consideration of other and understanding with who I was speaking really clarified communication in a way that was less rigid than traditional boundary setting. I left some tough situations feeling that I was flexible, considerate and cooperative even if the end result was not in my favor or if I was disappointing someone by staying consistent to my position. 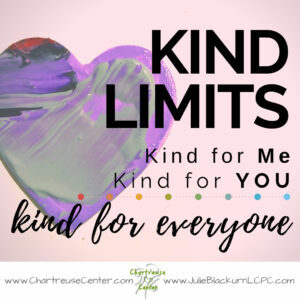 Download the Kind Limit Handout here. This is a sample of lessons that are offered within the Chartruese Center Online Courses. 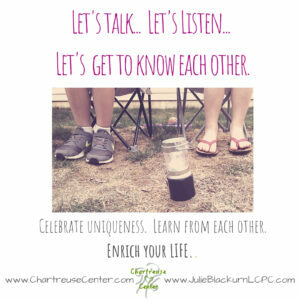 Chartreuse Center offers courses surrounding fertility, family and grief that make quality information accessible for all types of life situations. Visit https://artful-courses.chartreusecenter.com to learn more about Artful Online Courses. Join the email list, stay informed and be the first to know about upcoming events and tools you can use in your everyday life for fertility, parenting and grief concerns.